At the landmark centennial anniversary of the 1917 Jones-Shafroth Act, which granted Puerto Ricans U.S. citizenship, the island confronts an unfolding humanitarian crisis initially triggered by an acute economic crisis surging since 2006. 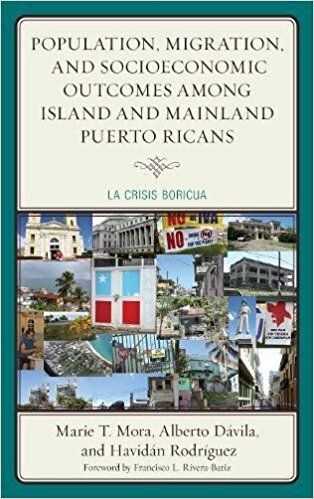 Analyzing large datasets such as the American Community Survey and the Puerto Rican Community Survey, this book represents the first comprehensive analysis of the socioeconomic and demographic consequences of “La Crisis Boricua” for Puerto Ricans on the island and mainland, including massive net outmigration from the island on a scale not seen for sixty years; a shrinking and rapidly aging population; a shut-down of high-tech industries; a significant loss in public and private sector jobs; a deteriorating infrastructure; higher sales taxes than any of the states; $74 billion in public debt plus another $49 billion in unfunded pension obligations; and defaults on payments to bondholders. This of course, before the recent devastation of Hurricane Maria.